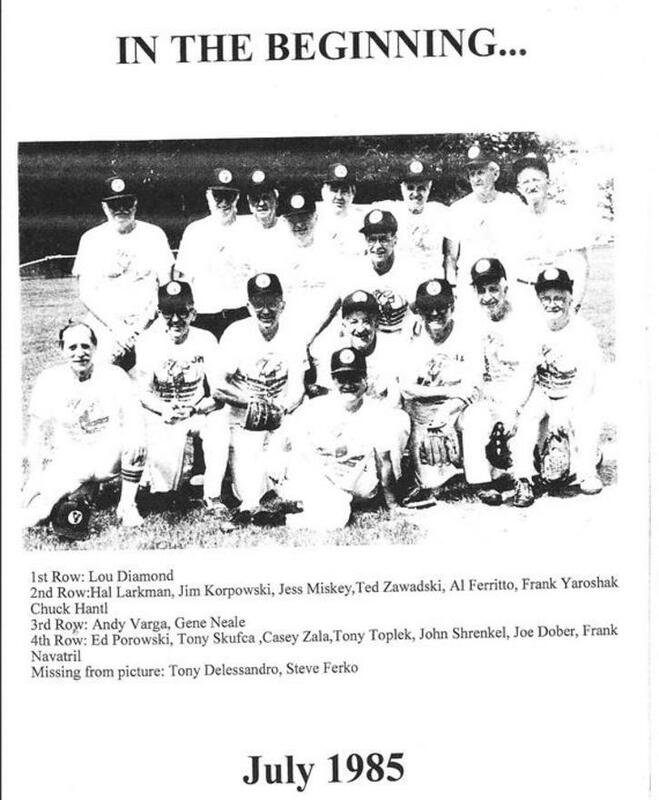 The league began in 1985 by Frank Yaroshak when he placed in a church bulletin “Wanted Softball Players – minimum age 62 years”. The first meeting was held shortly thereafter in his home. There were six players in attendance at the meeting, including Gene Neale, who is credited with the name Huff-N-Puffers. Gene became the first president. The first league consisted of sixteen players. 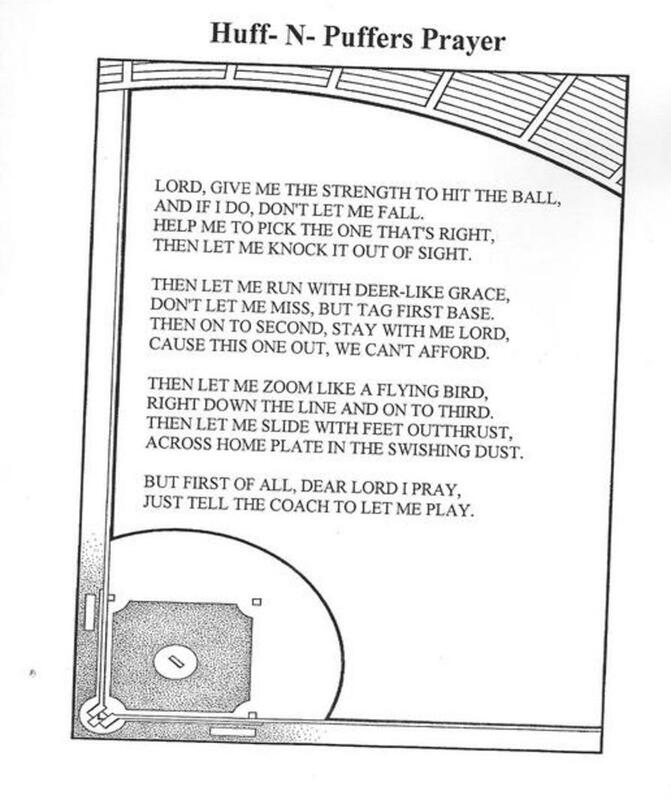 They began play at Shiloh High School in Parma, Ohio. Prior to playing of the game they were Grorends Keepers. Shovel and rake were as important as bat and ball. They provided their own bases. The second year they had four teams. An article written in the Sun Post, a local newspaper, about the “dedication and spirited playing” resulted in additional players. There were articles written in the Cleveland Plain Dealer by sports columnist Russell Schneider (a player) which enhanced the league. The following year the league grew to six teams, then eight team, and so on. In the first year, hats and shirts were donated by Caesar’s Pizza. Today, 2014, the league consist of nine senior teams and six junior teams averaging sixteen players per team. 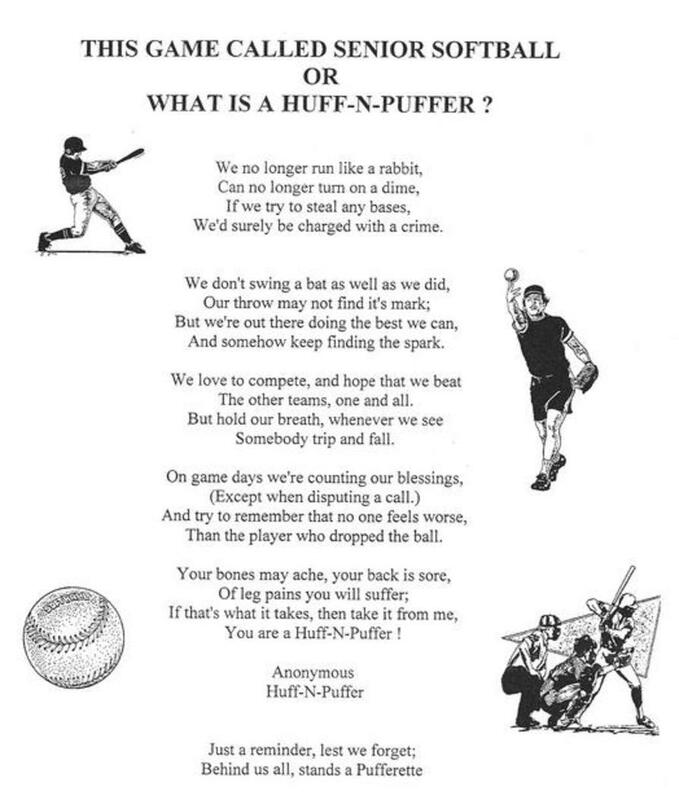 The name Huff-N-Puffer was originated by Gene Neale, who wrote “We are called the Huff-N-Puffers not because we are winded running to first base, but because of the children’s book The Little Engine That Could. The little engine had to cross the mountain to deliver food and medical supplies to the ill and hungry. As the little engine huffed and puffed over the mountain, it kept repeating, ‘I can do it. I can do it. I can do it. And so I did.’ We are in some way like the little engine. For we keep reminding ourselves ‘We can do it. We can do it. We can do it’. We huffed and puffed when we first started playing. However we know the exercise has benefitted many a heart and stroke patient. Father Time has laid down his scythe and taken up bat, ball and glove.” As the years have rolled by, softball heaven purchased the contracts of most of our original members. We today remember and thank them for their foresight and dedication in forming the league that so many of use enjoy today. We have a number of players who have competed in semi and pro sports. Though a fun league it was not long before we competed in qualifying tournaments. We competed in the first world series of senior softball. We have played in tournaments in Arizona, Florida, plus many other tournaments. We also play exhibition games. Our popularity continues to increase. We have players from 35 cities and communities. We are sponsors of little league teams in the Cleveland, Ohio vicinity. The Red, White and Blue has marched many Memorial Day parades, as many as 30 players. During the season we have a hot dog roast, a picnic and a steak roast. In October, each year we have a softball banquet to recognize the senior champion and the junior champion. The winning teams are presented jackets for each player (purchased by the league). The team sponsor is presented a trophy for their support. The event usually hosts approximately 150 attendees. At the banquet we recognize “The Man of the Year” with a plaque for donating his time and effort to the betterment of the league and the health and happiness of the players. We assemble to play the great American pastime sport for the enjoyment. This is the game we recollect from our youth. We entertain the competitive spirit of victory. However this is not paramount. At the conclusion of the game we travel our particular path of life having known the joy of playing and fellowshipping with our friends and acquaintances. Thank you, Frank Yaroshak and the founding members-- as well as Russell Schneider for his articles.